Tokyo Tech researchers have identified an enzyme that could help increase the production of biofuel from the unicellular red algae called Cyanidioschyzon merolae. This enzyme belongs to the glycerol-3-phosphate acyltransferase (GPAT) family. Under unfavorable conditions such as nitrogen shortage, algae can store large amounts of oils known as triacylglycerols (TAGs). A precise understanding of the way they do so is very important in the biotechnology sector, because TAGs can be transformed to biodiesel. In this context, researchers are exploring the unicellular red alga C. merolae (refer Figure 1) as an exemplary organism to identify a means to enhance TAG production. Now, a study headed by Sousuke Imamura at the Laboratory for Chemistry and Life Science, Institute of Innovative Research, Tokyo Tech, has demonstrated that an enzyme known as GPAT1 plays a key role in the accumulation of TAGs in C. merolae algae even under their usual growth conditions— that is, without having to induce stress. 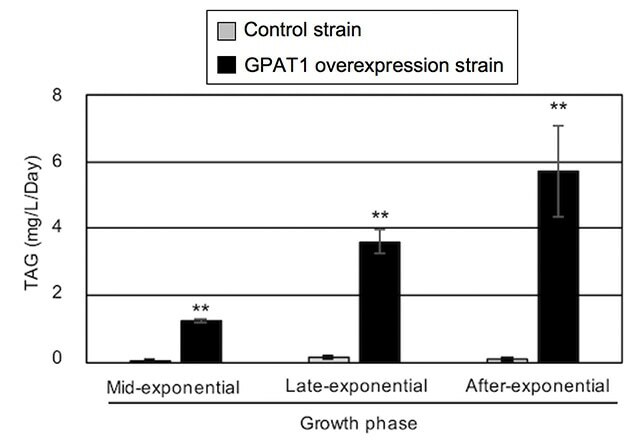 Interestingly, the researchers showed that the productivity of TAGs can possibly be boosted by over 56 times in a C. merolae strain overexpressing GPAT1 when compared to the control strain (refer Figures 2 and 3), with no negative impacts on algal growth. The results of the study, reported in Scientific Reports, follow up easier study performed by Imamura and others that had proposed that two GPATs - GPAT1 and GPAT2 - could be closely involved in the accumulation of TAGs in C. merolae. 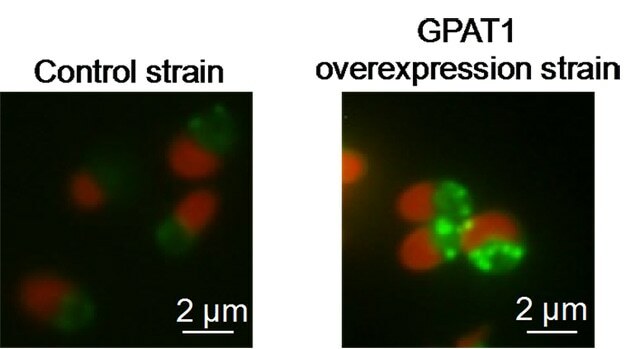 "Our results indicate that the reaction catalyzed by the GPAT1 is a rate-limiting step for TAG synthesis in C. merolae, and would be a potential target for improvement of TAG productivity in microalgae," say the researchers. The researchers intend to further study the way GPAT1 and GPAT2 could possibly be involved in the accumulation of TAGs. The next major step will be to identify transcription factors that regulate the expression of individual target genes. "If we can identify such regulators and modify their function, TAG productivity will be further improved because transcription factors affect the expression of a wide range of genes including GPAT1-related genes," they say. 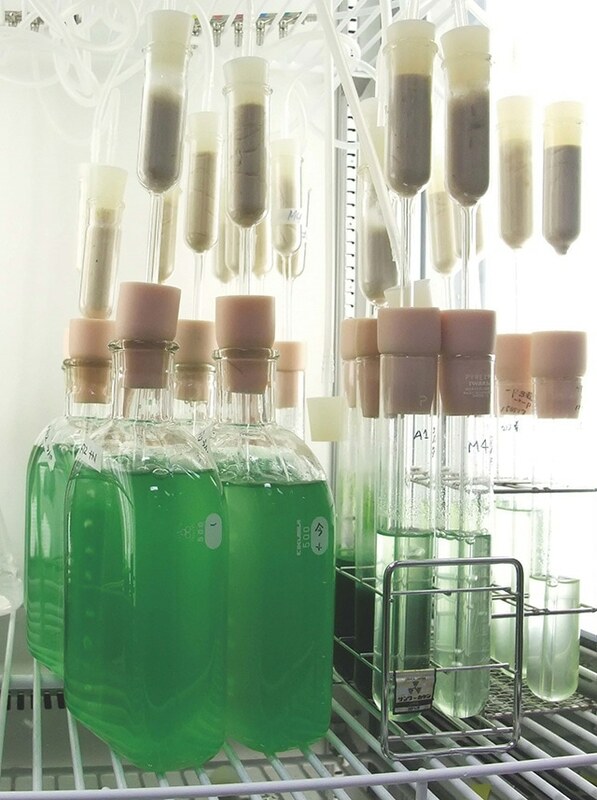 "This kind of approach based on the fundamental molecular mechanism of TAG synthesis should lead to successful commercial biofuel production using microalgae."